"Spontaneous human combustion" refers to the death from a fire originating without an apparent external source of ignition; the fire is believed to start within the body of the victim. The term was first proposed in 1746 by Paul Rolli in an article published in the Philosophical Transactions. 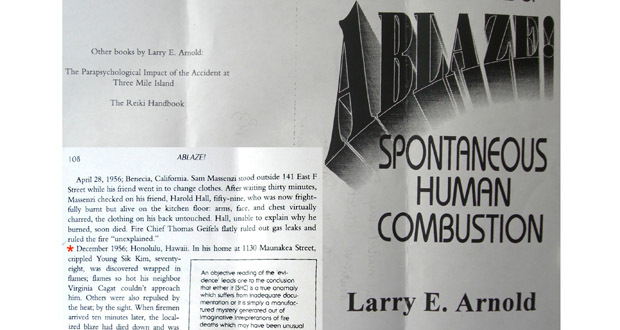 In his 1995 book Ablaze!, Author Larry E. Arnold wrote that there had been about 200 cited reports of spontaneous human combustion worldwide over a period of around 300 years. 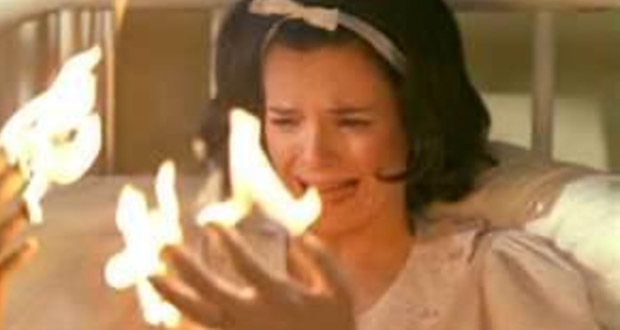 When British Medical Journal covered the topic of spontaneous human combustion in 1938, it noted the following common characteristics among recorded cases: victims were chronic alcoholics, mostly elderly females; the hands and feet usually fall off; fire caused little damage to combustible things in contact with the body; combustion left a residue of greasy and putrid ashes. Wick effect theory is a commonly offered explanation for the alleged phenomenon of spontaneous human combustion. It can occur under certain conditions and has been thoroughly observed. A person can be kept aflame through his/her own fats after being ignited, accidentally or otherwise. The clothed human body acts like an "inside-out" candle, with the fuel source (human fat) inside and the wick (the clothing of the victim) outside. In 1951, a 67-year-old woman named Mary Reeser was found burned to death in her house after her landlady realized that the house's doorknob was extremely hot. Her remains completely burned into ash, with only one leg remaining. Her chair was also destroyed. Detectives found her temperature to be around 3,500 °F, but everything else in the room was found intact. A common theory is that she was smoking a cigarette after taking sleeping pills, and then fell asleep while still holding the burning cigarette, which could have ignited her gown, ultimately leading to her death. In 1966, a 92-year-old physician named John Irving Bentley was found burned to death in his house in Pennsylvania. All that was left of him was the lower half of his right leg with the slipper still on it. There was foot long square in the floorboards and the rest of his body had been reduced to a pile of ashes in the basement below. His walker lay across the hole in the floor generated by the fire. The rubber tips on it were still intact and the nearby bathtub was barely scorched. In 1980, a 73-year-old man named Henry Thomas was found burned to death in his living room in South Wales. His entire body was incinerated, leaving only his skull and a portion of each leg below the knee, which still had socks and trousers. Half of the chair in which he had been sitting was also destroyed. His death was ruled 'death by burning', as he had plainly inhaled the contents of his own combustion. In 1982, a mentally handicapped woman named Jeannie Saffin was reported to have spontaneously caught fire by her father who was with her. She was doused with water and was taken to hospital where she died 8 days later. One witness claimed that Jeannie had flames coming from her mouth, made roaring noises like a dragon and that her clothes were unburned. Later research found that her clothes were burned and hospital records found that her mouth was undamaged. In September 2017, a 70-year-old pensioner named John Nolan spontaneously burst into flames while walking on the streets of North London. People tried to help him at the scene but he died in hospital the next day from his burns. Investigators were unable to establish a reason for this incident and his death was treated as unexplained. His post-mortem gave the cause of death as severe burns. Almost all cases of Spontaneous Human Combustion involve persons with low mobility due to advanced age or obesity, along with poor health. 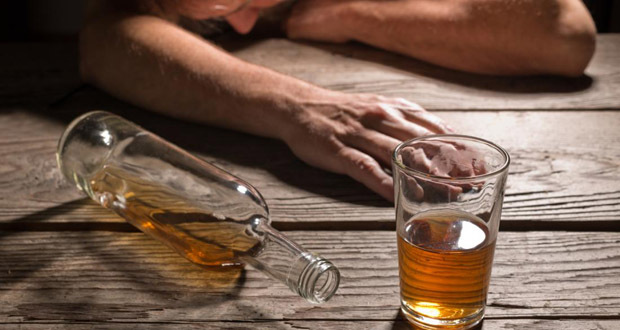 Victims show a high likelihood of having died in their sleep, or of being unable to move once they had caught fire.